The city of Atlantis awaits! Just don't forget about the darkness lurking in every shadow, the knives poised inches from your back, and the fell sorcery that fairly drips from every eve and gutter. The city of Atlantis is brought to life with the Atlantis: City Guide. 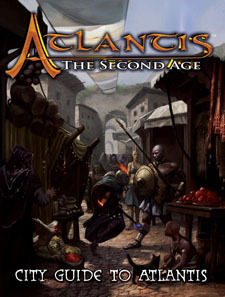 Over 100 story and plot hooks to fuel the imagination, creating Atlantis campaigns for years to come.